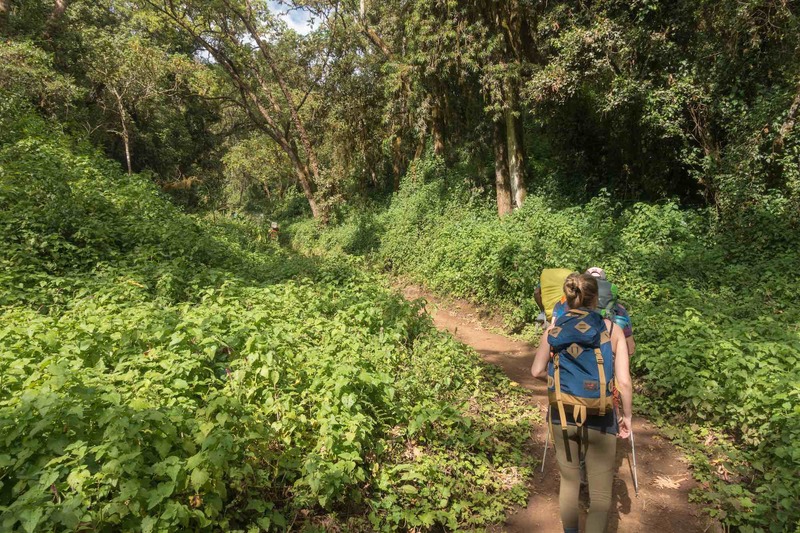 I returned from my Meru trek looking forward to a day’s rest before we set off on the main event of my Tanzania visit, an eight-day trek via the Lemosho route to the top of Kibo on Mount Kilimanjaro. Waiting in the Popote Africa Adventures office while the staff laminated my Meru certificate (! ), I noticed that I was the only client scheduled for the Wednesday departure. 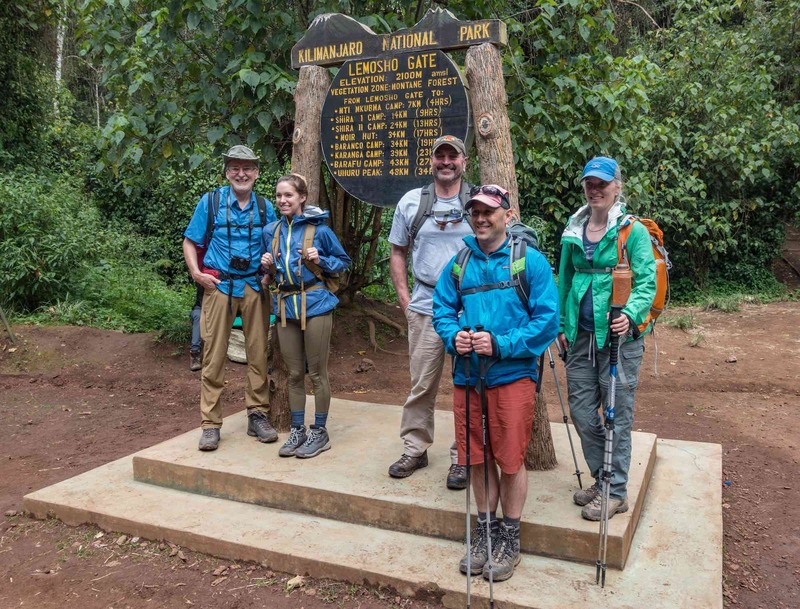 On the calendar board, another Lemosho trip was listed for the very next day – and it had four trekkers. A minute later, my trek was no more and my name was added to the Thursday departure. 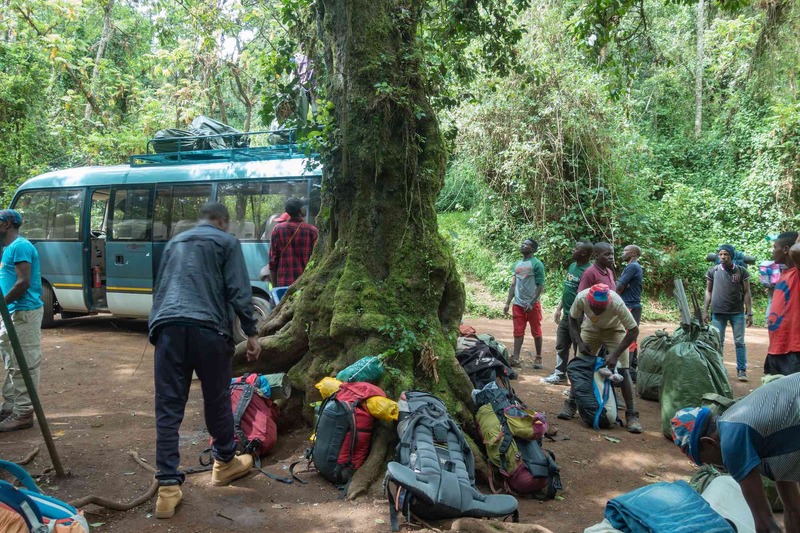 It would certainly simplify Popote’s logistics, beginning with the three-hour ride from Moshi to the trailhead on the west side of Kilimanjaro. Doing it once with five made more sense. While I would meet a few trekking groups made up of just one trekker with his/her support staff of four or five, being in a small group provides you with other voices and other stories and with extra motivation on those occasions when you’re flagging a bit. Our group of five would be a perfect number – three Canadians and two Americans ranging in age from 25 to 67. 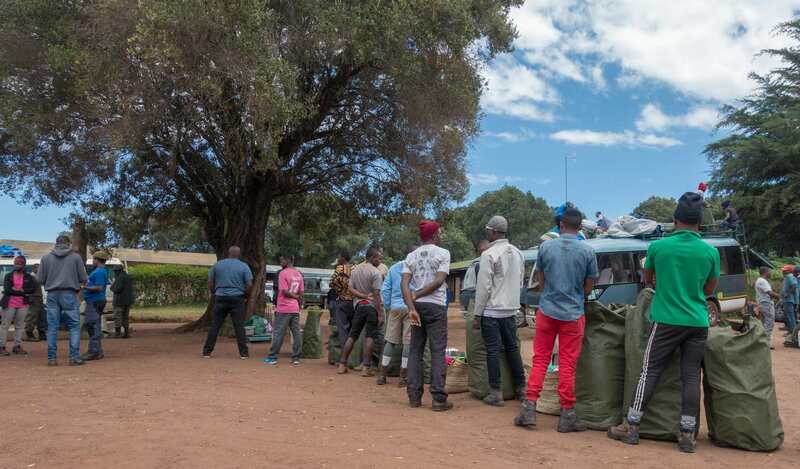 Seven days later on leaving Barafu Camp at noon, I did watch as a large group of twenty trekkers entered the camp – 20 is definitely about 12 too many! We left the Parkview Inn at around 9:00 for the ride to Londorossi Gate. 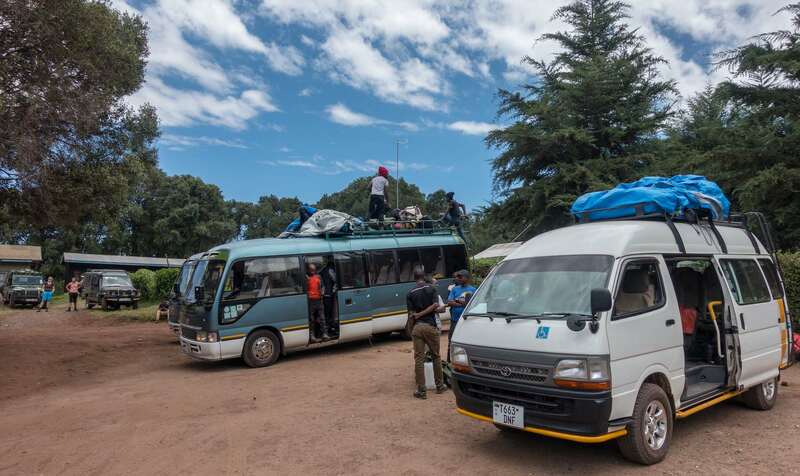 Already on the bus were two of our guides, Dixon and Majura, as well as most of the seventeen porters. The others we would pick up as we drove along the highway towards Arusha. 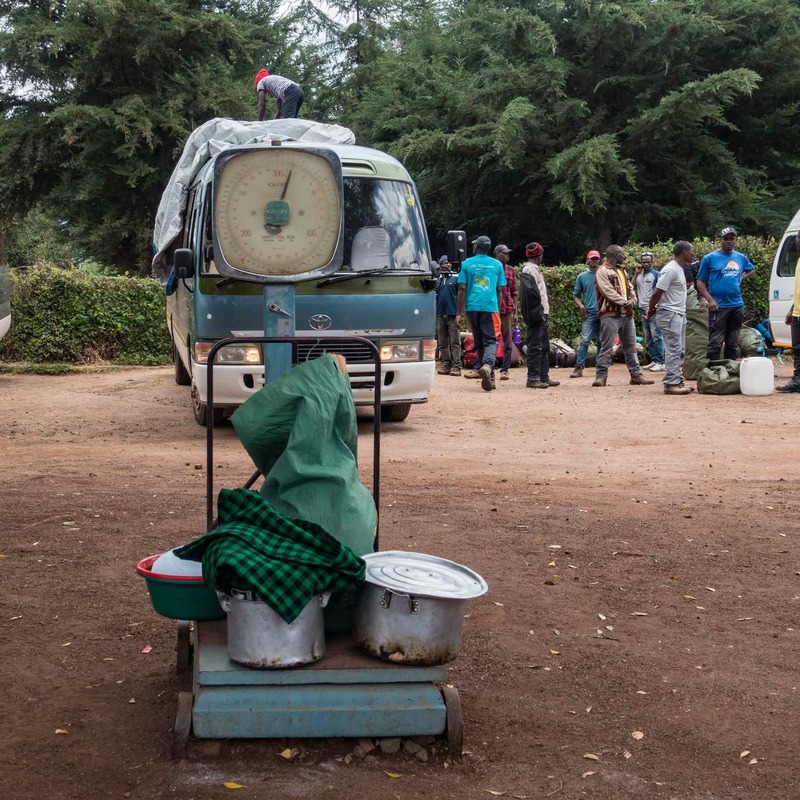 After we made the right-hand turn at Boma Ya Ng’ombe and headed north, we stopped for a half-hour at Sanya Juu while the crew had breakfast. 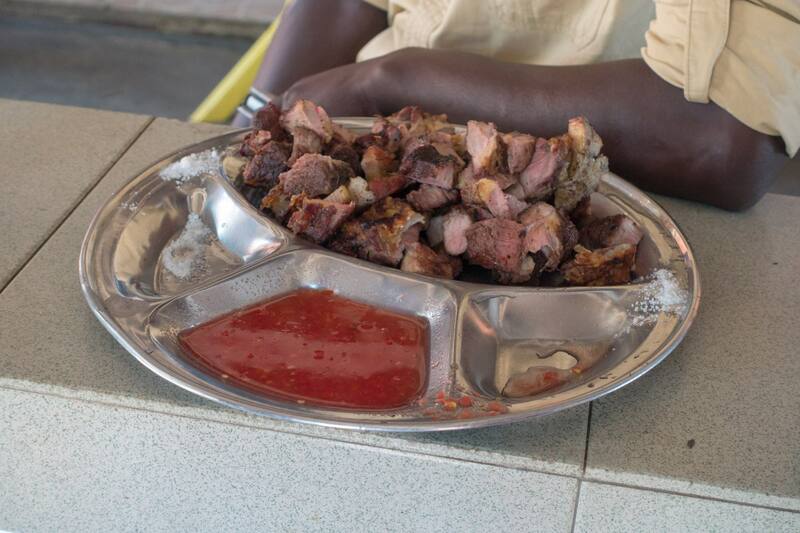 Barbecued meat is a Tanzanian staple – as is ugali, a cornmeal dough cooked to a consistency of thick mashed potatoes. 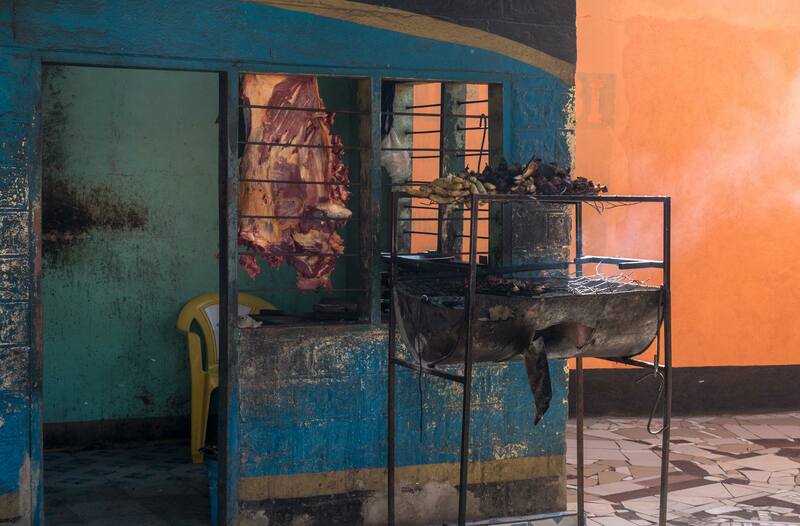 This would be one of those times when I – the only vegetarian in the crew – would watch as the others munched away with gusto from a shared plate of meat and ugali, salt, and dipping sauces! I had to do a double-take when I saw the guy in the Raptors jersey in front of the Crown Pub. I took the shot below but the one I really wanted was of the back of his jersey with the number 1 and the name McGrady on it. McGrady left the team in 2000 so we are talking retro here! 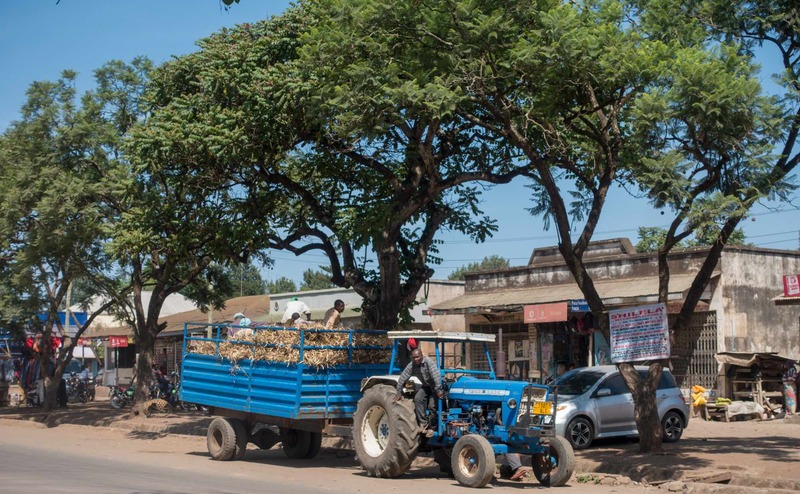 Sanya Juu is a farm supply town in the middle of an agricultural area that stretches to the north and up to the slopes of Kilimanjaro. 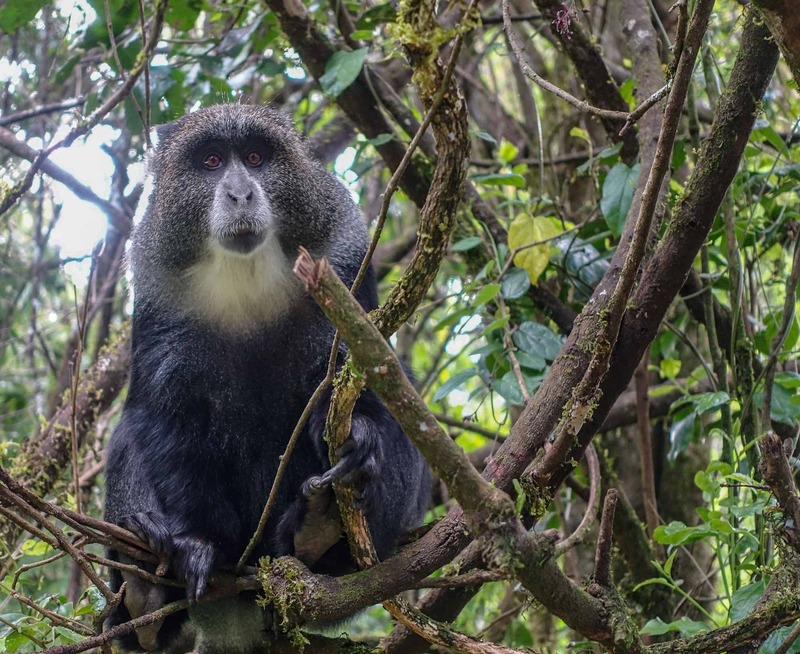 In years to come, the pressure on conservation areas and national parks like Serengeti will undoubtedly lead to shrinking wildlife areas and a smaller Kilimanjaro National Park. See the satellite image below for the current demarcation line! Already the likelihood of seeing any of the Big 5 animals on in the park’s forest section or on the Shira plateau just above is pretty much zero. 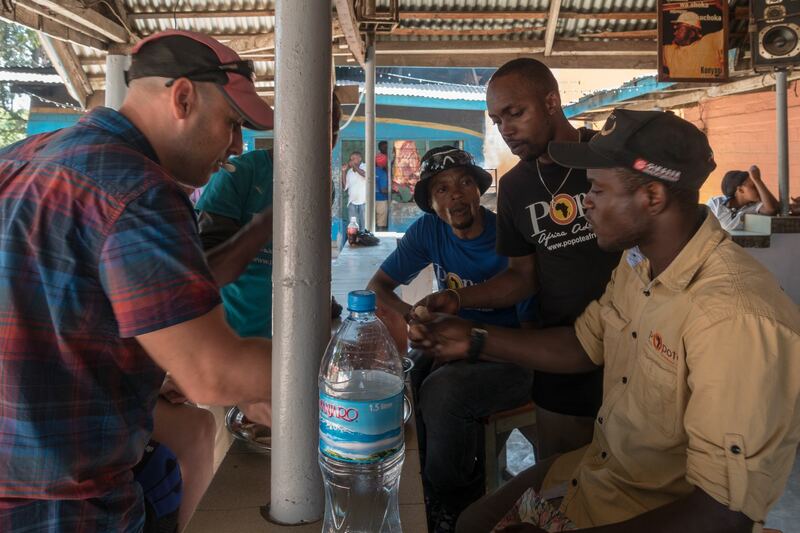 By 12:30 our three-hour drive up the west side of Kilimanjaro park brought us to Londorossi Gate, where we completed entry formalities. The Gate is the access point to a gravel road which goes into the Park itself and sees use as an emergency route. 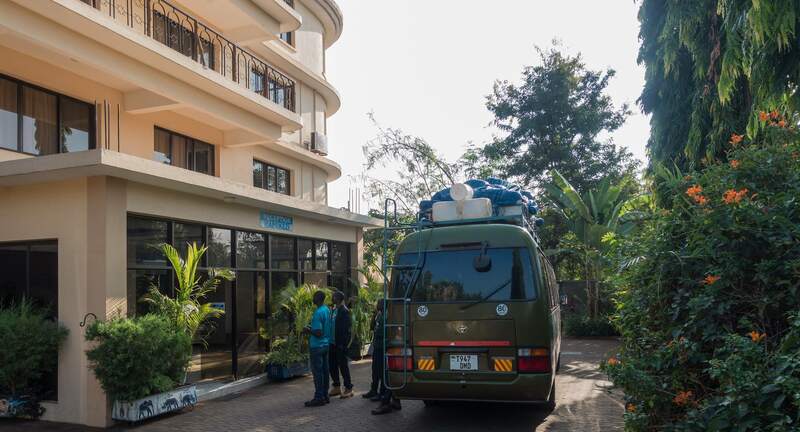 Some agencies also make use of it to drive their clients up to Shira 1 Camp. This is not a good idea since it deprives trekkers of the time their bodies need to acclimatize more gradually to the increasing altitude. 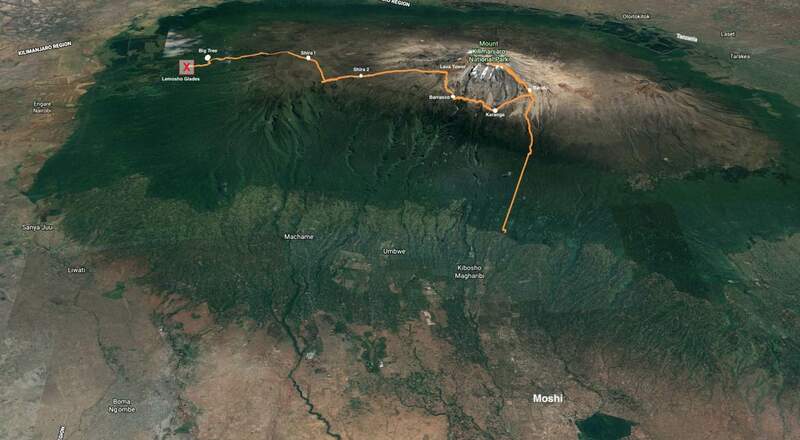 Shira 1 is at 3504 m/11496 ft.
Our first camp would be at Mti Mkubwa (Swahili for Big Tree). 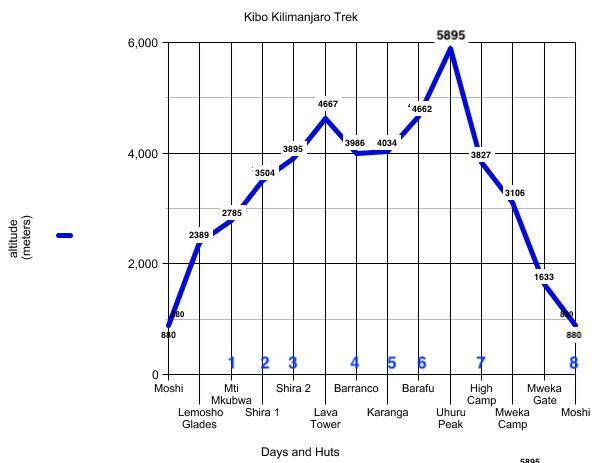 It is at 2785 m/9137 ft. a.s.l.., a more manageable elevation to deal with on Day 1. 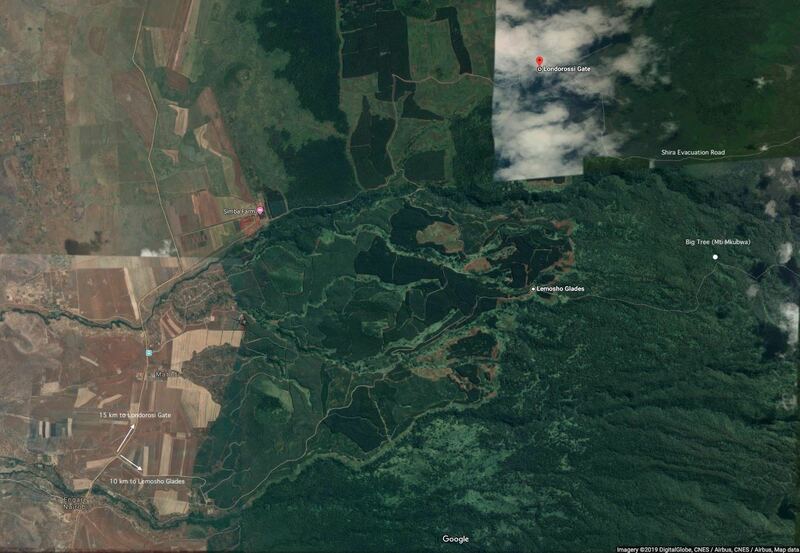 We drove past the side road to Lemosho Glades to go up to Londorossi Gate. Then we drove back down the where we had come from and headed for Lemosho Glades. 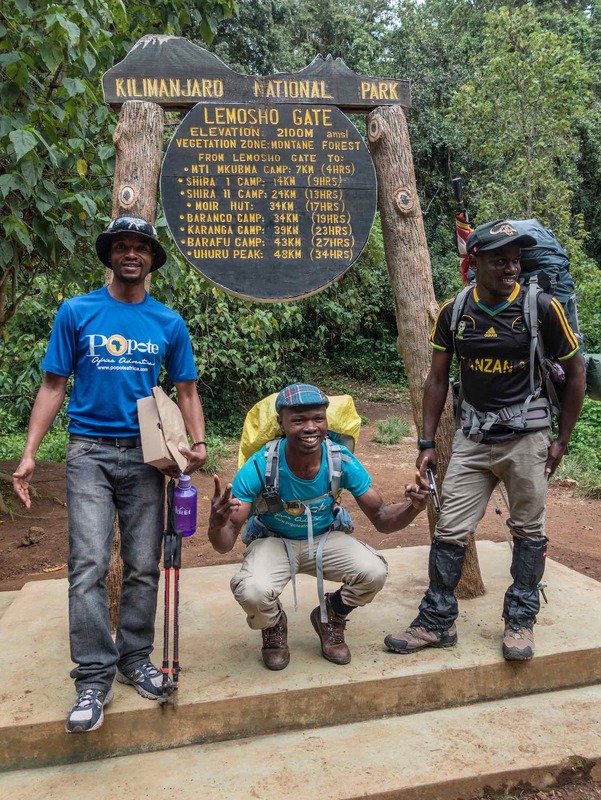 Since very few trekking groups make use of the Londorossi Gate entry, I did wonder what the point of us driving up to Londorossi Gate only to have to return to the junction where the road to Lemosho Glades turns off. 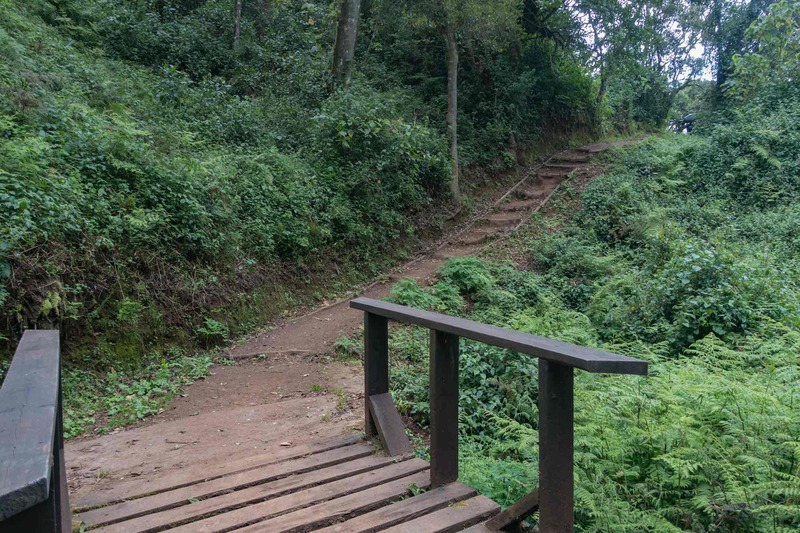 I guess the Lemosho Route is still new enough that the park officials have not gotten around to providing an entry point with facilities at the Lemosho trailhead. 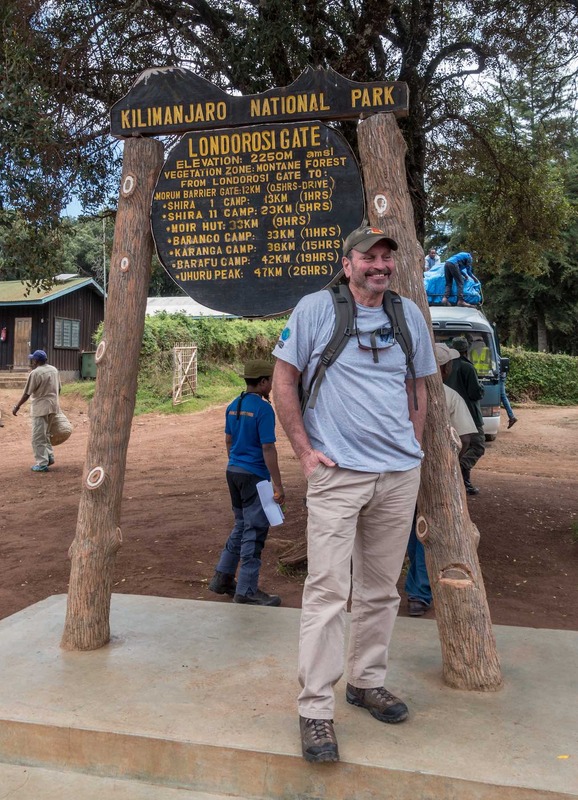 However, with the money that the Park and Government are taking in from each Kilimanjaro trekker – about $1000. – it cannot be for lack of funds! 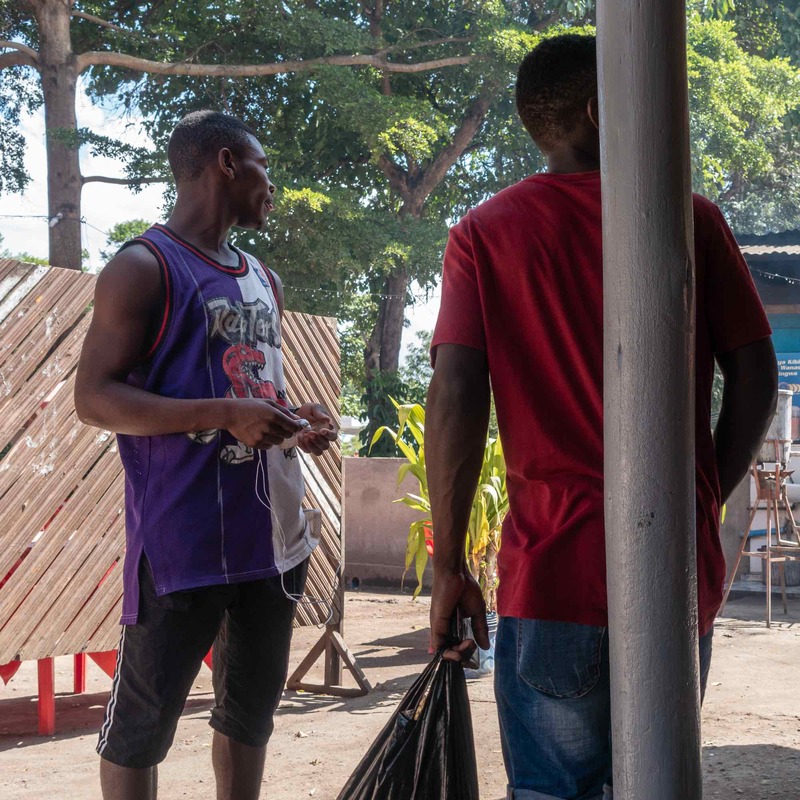 When they do get around to it, a Lemosho Gate with full weigh-in and sign-in facilities will eliminate about an hour of wasted time. One reason that a stop at Londorossi is necessary is to have all the gear and supplies weighed. I had to laugh when I saw the line-up of agency staff and the equipment available for their weigh-in. While the Popote crew had everything weighed, we had lunch in a roofed lunch area. Thirty meters away some local men were standing by the gate and hoping to get last-minute jobs as porters for those agencies which had underestimated the amount of stuff they had and needed an extra porter or two. And here are the five muzungu they were shepherding! 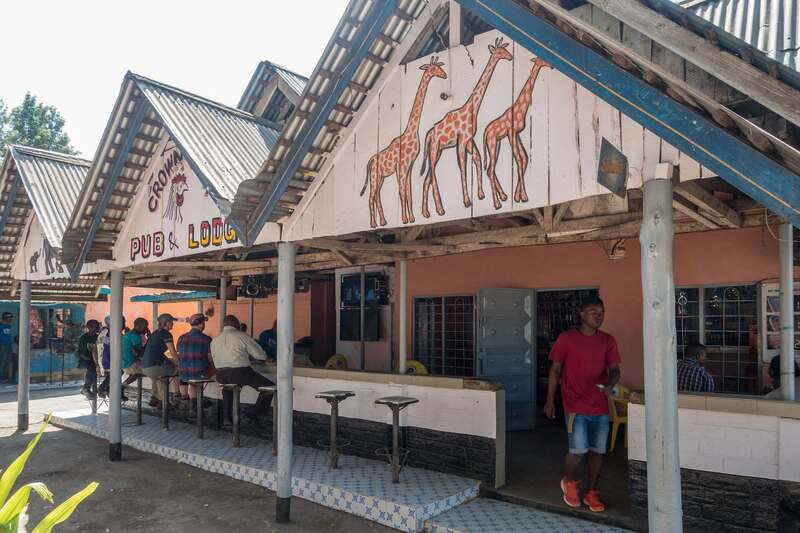 (The Swahili term apparently means “a dazed person who walks around in a circle”, a description which may well apply to some tourists! Here are the stats and route track generated by my Polar M430 GPS/HR monitor/watch. Over the next two-and-a-half hours we’d gain four hundred meters in altitude (2785 m – 2389 m). From my heart rate date you can see that it is a pleasant walk in the park – well, lush forest with an easy trail to follow at an average speed of 2.1 km/hr.! 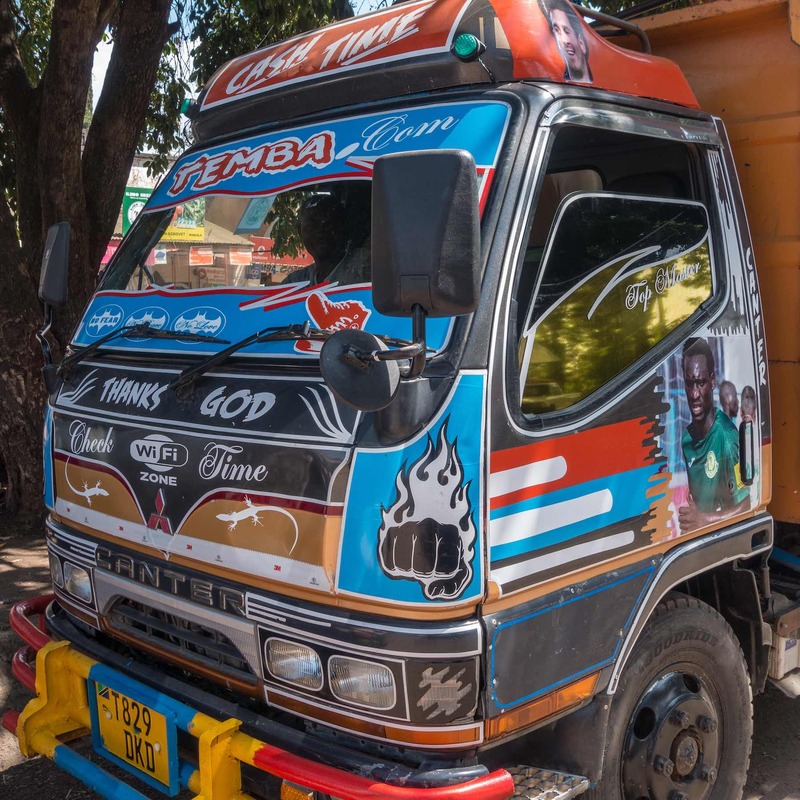 Not for the last time, we would hear the Swahili phrase pole pole – slowly, slowly! 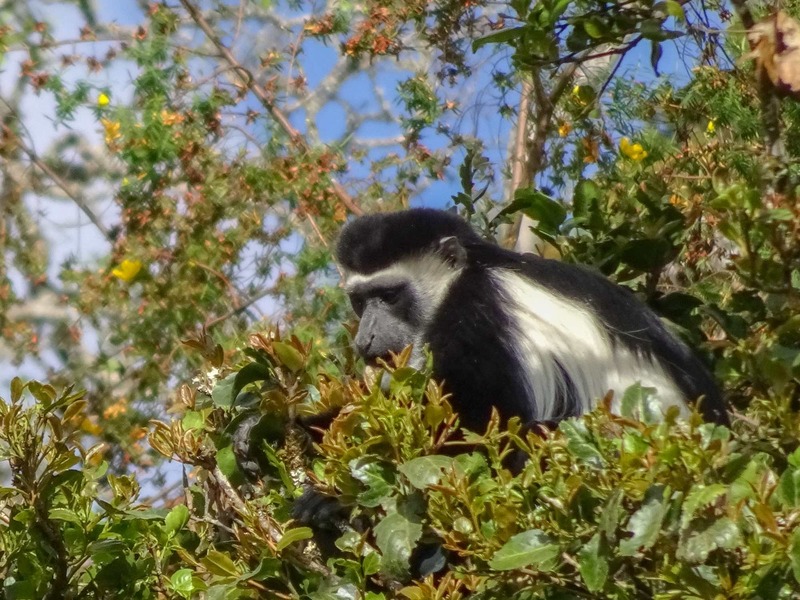 Along the way, we would also see some locals peering down from their tree perches at us as we walked by. By 5:30 we were at Mti Mkubwa Camp. Mti is Swahili for “tree” and mkubwa means “big”. 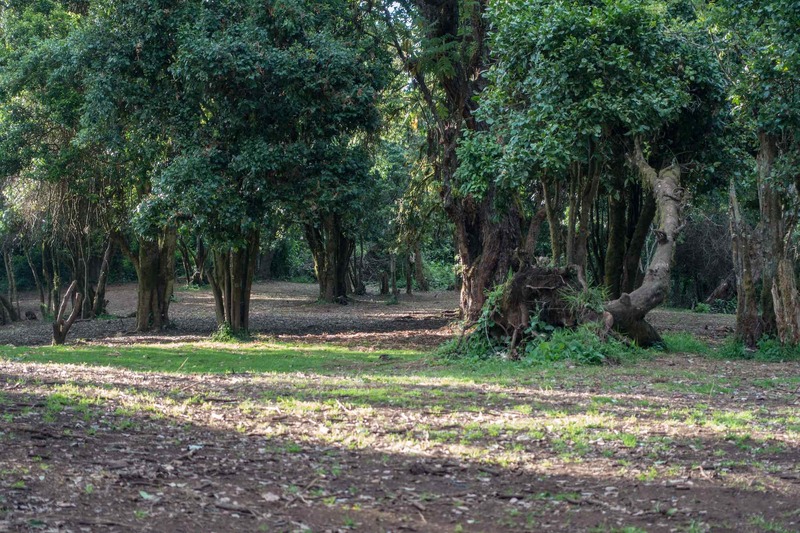 The camp area has room for dozens of groups of trekkers. On our arrival we found perhaps a dozen other tents up; it really was not very busy. Waiting in the dining tent for us after we had opened up our duffels and unfurled our sleeping bags and mats were the trays of popcorn you see in the image below! Some trekkers worry about the toilet facilities available on trek. During the day there really aren’t any other than the privacy provided by a well-placed rock or boulder. 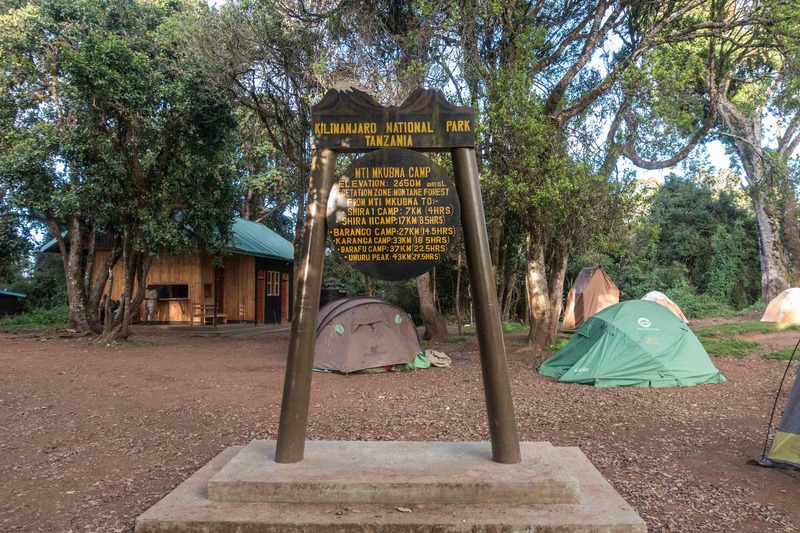 At campsites at the start of the day and at the end there are facilities provided by the park. Some are for use by the local staff – as are the ones which look like the first one below. There is a more palatial facility that looks like the one below that sometimes has a notice on it saying – Tourists Only. 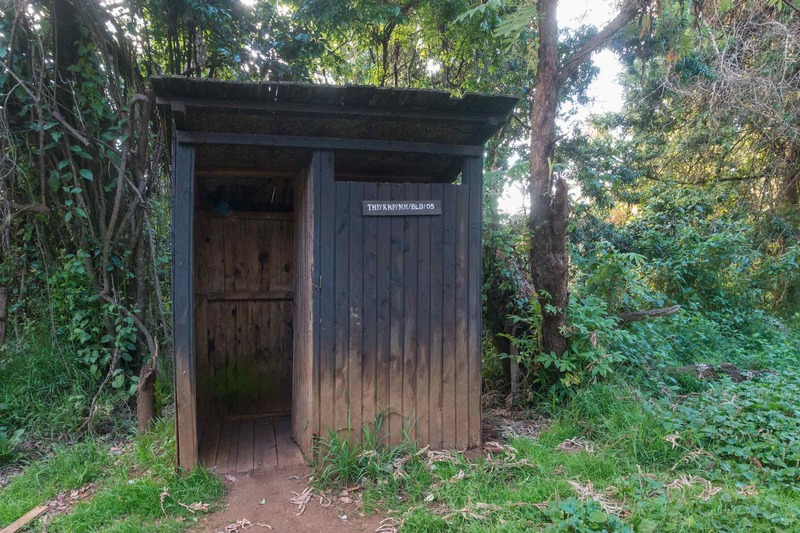 A number of the Camps on the Lemosho Route had one of these newer outhouses. We were lucky to have had our own little toilet tent which Popote included without charge. 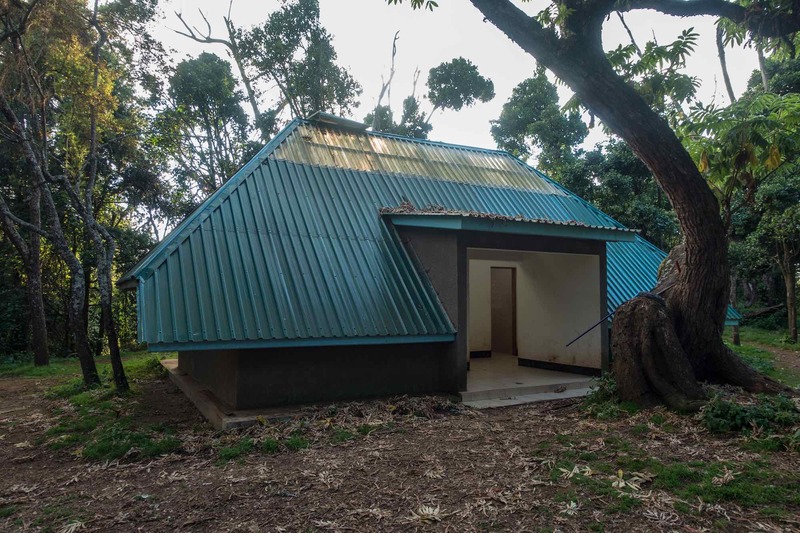 one of the new toilet facilities on the slopes of Kilimanjaro – for tourists only! 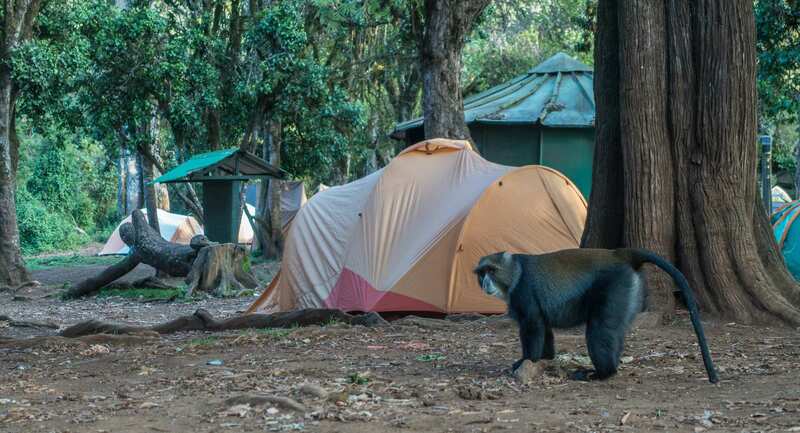 Meanwhile, our camp attracted a local who has obviously become habituated to the presence and the promise of humans in his neck of the woods. By 6:30 or 7:00 p.m. it is already dark and there is not really a lot to do. 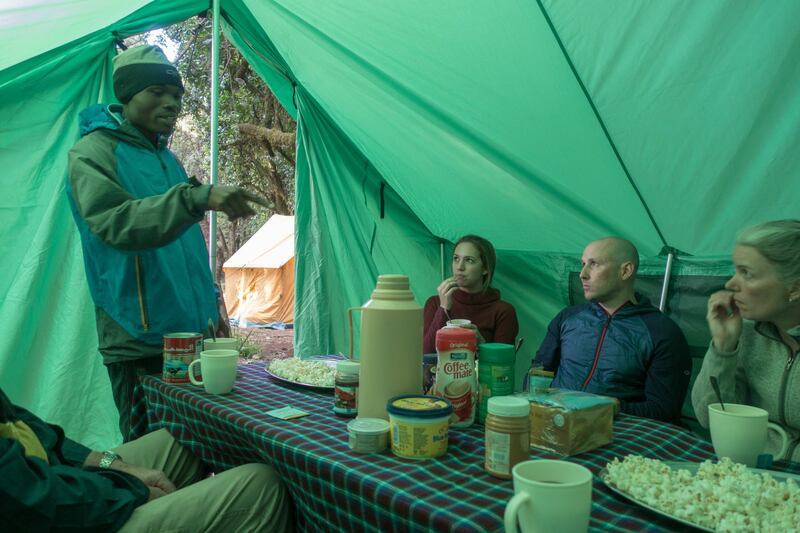 Of course, you’ll hang out in the dining tent with your fellow trekkers and sip tea and talk about the events of the day and all sorts of other things but soon everyone will have slipped away. On our Day 1, it was 8:30 when the last two of us left the dining tent; that would stand as the latest time ever! Off to bed – “To sleep, perchance to dream” of the next day’s walk!